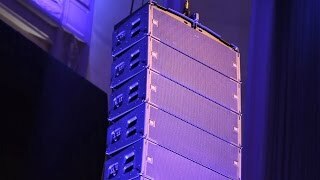 The JBL A Series is a complete tour sound solution for mid- to large-size touring applications and high-end fixed installations. JBL VTX A12W was designed to address the requests from rental companies, FOH engineers and tour sound production crews who appreciated the advances introduced in the VTX A12, but needed wider horizontal coverage for their applications. Like the VTX A12, next-generation JBL transducer technology and a high-frequency waveguide design deliver unmatched performance, sensitivity and coverage—and now a 120-degree dispersion pattern ensures coverage for a variety of applications. VTX A12W features the same patented JBL rigging mechanism and redesigned suspension system to streamline deployment and setup, and can be flown independently or in mixed configurations with the VTX A12. Plus, VTX A12W retains the same physical design, compact size and reduced weight found in the original A12. The JBL A Series isn’t just a superior line array—it’s a completely new way to approach tour sound. philosophy. 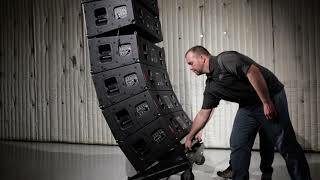 For this reason, any current JBL product may differ in some respect from its published description, but will always equal or exceed the original design specifications unless otherwise stated. The VTX A12 AF is a lightweight Array Frame used for suspending VTX A12 series enclosures. The frame was designed to operate in either single-point, front-to-back or side-by-side suspension modes using the VTX A12 AF EB Extension Bar. The extension bar is compatible with 5/8” shackles and can be stored above the main frame during transportation. The extension bar can extend to the front or the rear of the frame to accommodate both up-tilt and down-tilt aiming options. Three connection points are available for attaching the Extension Bar to the main frame, allowing for precise control of shackle positioning for single-point applications. Support for 3rd party inclinometers is available using the included laser attachment bracket. One VTX A12 AF EB Extension Bar is included and additional Extension Bars can be purchased to facilitate side-by-side suspension. The VTX A12 AF EB Extension Bar was designed to operate in conjunction with the VTX A12 AF Array Frame to facilitate either single-point, front-to-back or side-by-side suspension modes. The extension bar is compatible with 5/8” shackles and can be stored above the main frame during transportation. The extension bar can extend to the front or the rear of the frame to accommodate both up-tilt and down-tilt aiming options. Three connection points are available for attaching the Extension Bar to the main frame, allowing for precise control of shackle positioning for single-point applications. One VTX A12 AF EB Extension Bar is included with the Array Frame and additional Extension Bars can be purchased to facilitate side-by-side suspension. The VTX A12 VT Vertical Transporter is a robust, lightweight cart solution for vertically transporting up to 4 x VTX A12 enclosures. The VTX A12 VT is constructed out of aluminum and steel parts and measures 45” (1143mm) wide and 24” (610mm) deep. Two attachment points are available on each side of the VTX A12 VT for connecting to the optional VTX A12 VT GND Ground Stack outrigger system. When used together, the VTX A12 VT becomes a fast and easy solution for deploying ground-stack arrays without having to remove the cabinets from the cart. The VTX A12 VT comes standard with a hard-top (VT-TOP) attachment that connects to the topmost cabinet of a stack to create a robust and defined footprint that stabilizes the carts during transportation and allows other gear to be placed above for maximum truck-pack efficiency. A reinforced protective cover is available (VTX A12 VT CVR) and supplied separately. The VTX A12 VT CVR is a heavy-duty soft cover designed to work with the VTX A12 VT vertical transport system. The cover is sized to cover 4 x A12 enclosures and includes 2 x industrial-rated zippers for easy and reliable deployment. The cover includes input-panel flaps, allowing the A12 enclosures to be tested without having to remove the cover. Two handle cut-outs are provided for easy handling, and a clear pocket is provided for shipping labels. The front section panels are internally reinforced for maximum protection of the speaker grills. When not used, the VTX A12 VT CVR folds into a compact footprint and stores within the VTX A12 VT. The VTX A12 VT GND outrigger system works in conjunction with the VTX A12 VT and allows A12 enclosures to be groundstacked without the need to remove speakers from the transportation cart. The two outriggers extend in front of and behind the stack and connect to the VT using the two included Quick-Release Pins. Screw jacks are used to lift the stack off the ground, and the innovative spring based angle-set hinges are used to adjust aiming. The hinge mechanism uses gas-filled springs, which allow adjustment of the overall stack angle without having to lift the speakers or move any heavy parts. The VTX A12 SB accessory is a lightweight suspension bar that can be used as an array frame or to implement pull-back of a VTX A12 array. When used for pull-back, the VTX A12 SB can be attached to the bottom cabinet of an array and connected to a rear suspension point to allow for extra down-tilt, otherwise not possible using the VTX A12 AF alone. 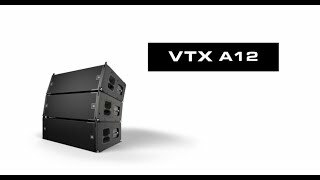 The VTX A12 SB can also attach to the top cabinet of an array and used as a compact array frame. In this mode, the suspension bar connects to the top cabinet’s rear rigging points and the down-tilt angle is controlled by the number of cabinets and array geometry. 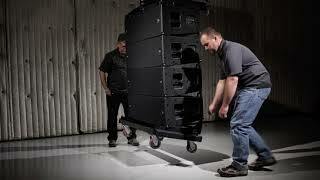 JBL’s Line Array Calculator software application is used to calculate the down-tilt angle. Two VTX A12 SB suspension bars can be used: one at the top and one at the bottom of the array, for dual-point applications and added aiming flexibility. The VTX A12 SB can support the weight of up to 18 x VTX A12 enclosures and a 5/8” shackle (included) can be attached directly to the bar. The VTX Delta Plate is a rigging accessory used for controlling the horizontal aiming of an array. Two chain motors are attached to the Delta Plate, allowing for adjustments of up to +/- 10 degrees. The VTX Delta Plate can be also used to distribute the weight of an array to two points, and the recommended space between the two pick points is 1 meter (3.3’). The VTX Delta Plate is compatible with all JBL line array products and it can support the weight of up to 24 enclosures. The VTX Delta Plate is made out of high-grade steel and comes with 2 x 5/8” shackles. Learn how to optimize the performance of your JBL products.